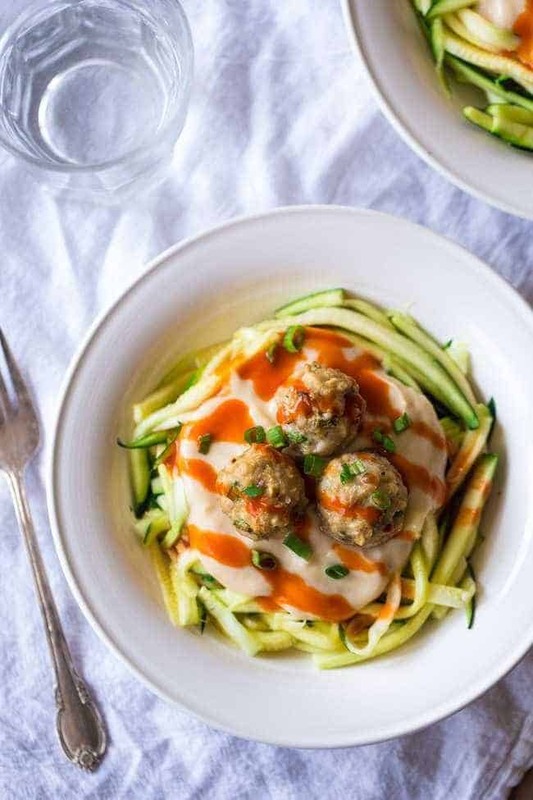 These Easy Healthy Buffalo Chicken Meatballs have a ranch twist and are paired with cauliflower Alfredo sauce and zucchini noodles for a quick, easy and healthy dinner! Cauliflower Bakes are the new AND IMPROVED mashed potatoes. Cauliflower rice is givin’ those carbo filled rice bowls a run fo’ their money. And now I can even turn your albino-tree-likeness into cauliflower Alfredo sauce. Sauce that tastes like my favorite creamy Alfredo, but with about eleventy billion percent less fat/calories and general I-wont-even-attempt-to-eat-that-in-my-skinny-jeans qualities. You guys. It’s pure love in vegetal form. Note the specified “vegetal” form. I have to reserve the “people” form for the Hubs. Or else he might get jealous and have some sort of cauliflower skirmish in my kitchen. Which would be kind of fun to see. Hmmm…. 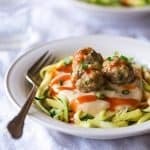 Yes, like the Greek Yogurt Dip from Monday, we are eating cauliflower turned into something that you wouldn’t really expect it turned into with these easy healthy buffalo chicken meatballs. But, remember when we had Mexican Cauliflower Tater Tot Casserole, Mexican Lentil Homemade Hummus AND Mexican Quinoa in the crock pot in ONE week? I get HOOKED on something and I. Just. Can’t. Stop. 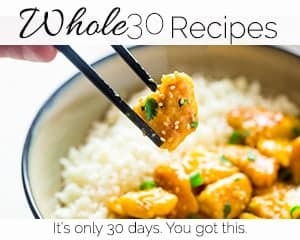 Plus, there is that whole “Cauliflower sauce is ACCOSTING my eyeballs at every click of a new page and every time that I visit Pinterest.” It’s like the impending stomach ache DOOM after you face-plant into a plate of breaded, crispy pork with DOUBLE the Sweet and Sour Sauce at Panda Express. YOU JUST CAN’T GET AWAY FROM IT. Not that I know anything about that or anything. So, I listened to what internet land was telling my soul, and I tried it. Which lead to the realization of why it happens to be in every single nook and cranny of the interwebz. UM WHOA. <3 <3 <3 It’s DANG DIGGITY DELICIOUS. Like creamy. And thick. With a flavour POW that you would not think that this pale, bland, sad looking little vegetable would have. 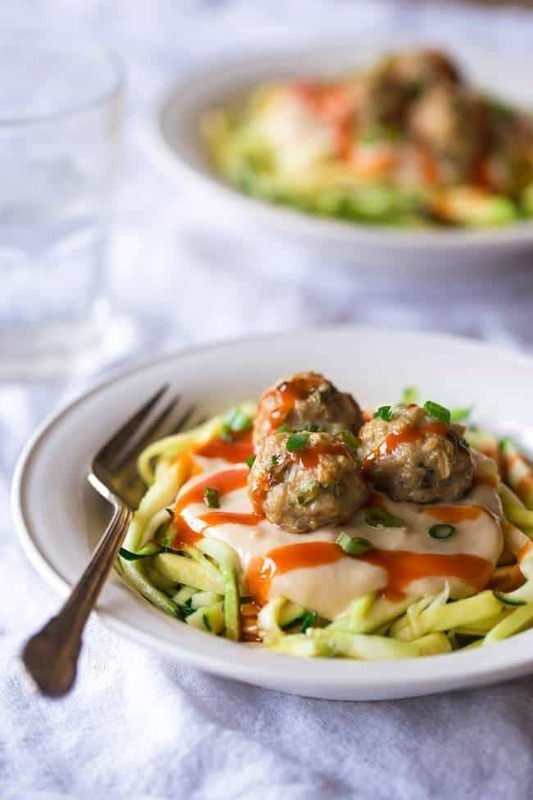 ESPECIALLY when you swirl it around with these easy healthy buffalo chicken meatballs. You knew it was coming. My friends, it is the season of Buffalo ALL THE THINGS. And, yes, that is foreshadowing. 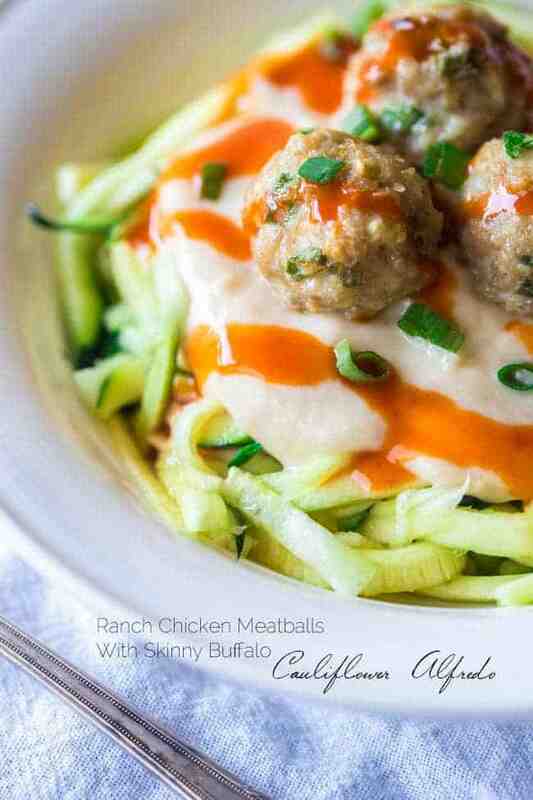 After this buffalo chicken meatballs recipe, there will be another Buffalo creation coming to a face near you. I wouldn’t want you to have to eat Q-tips on Game Day. Just giving you options. Also, don’t even ask why Q-tips was the first thing that came to mind when thinking about weird things to eat. Now, as ah-may-zing as the sauce/buffalo/ohmygoshcreamygoodness is, I don’t want to push aside the actual recipe for ground chicken meatballs. 🙁 <— That is what they would look like if I let that happen. You guys. 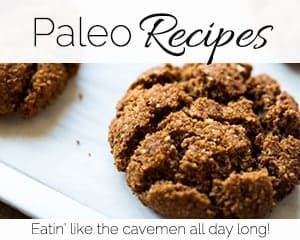 These are the kind of skinny buffalo chicken meatballs that your Hubskerdoodle asks you to make extra of so that he can freeze them and bring them in his lunch bag for all the evers left of his life. The kind of meatball that make you say “OH HELLO YOU TASTY THANG YOU” when you bite into it. You know why? Cheesy goodness with a super-secret-surprise ranch twist. Are you even going to question the goodness of all that WITH buffalo sauce, so-creamy-that-I-might-even-put-it-in-my-coffee Cauliflower Alfredo And more low, carby vegetable goodness with some zucchini noodles? 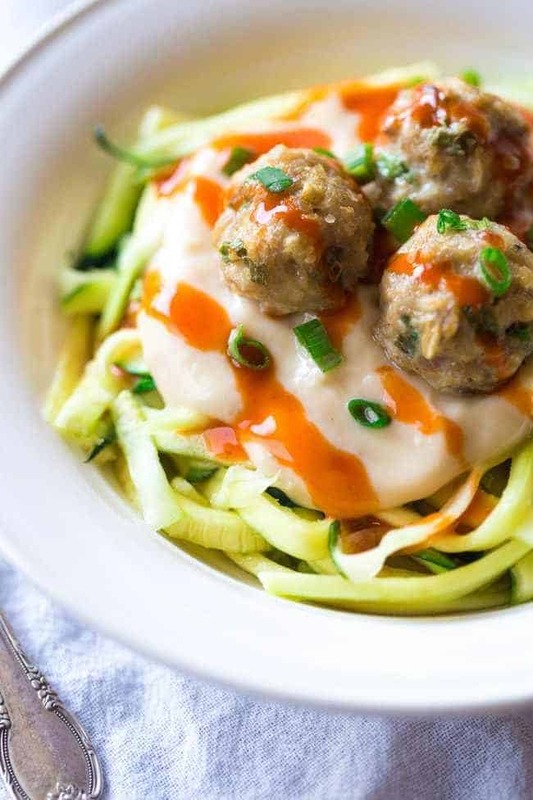 These easy healthy buffalo chicken meatballs are a DELISH dinner for your Game Day. That doesn’t even remotely resemble a Q-tip. I figured you’d be okay with that. 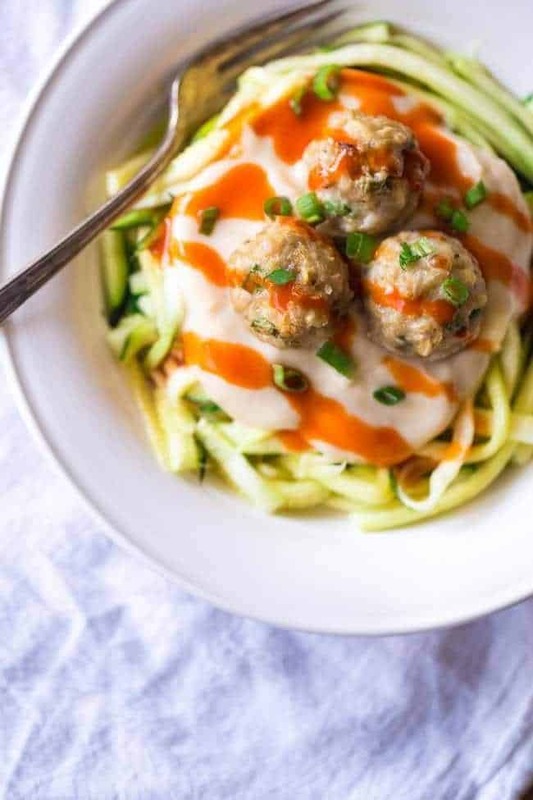 These easy healthy Buffalo Chicken Meatballs have a ranch twist and have cauliflower Alfredo sauce and zucchini noodles for a quick, family friendly dinner! 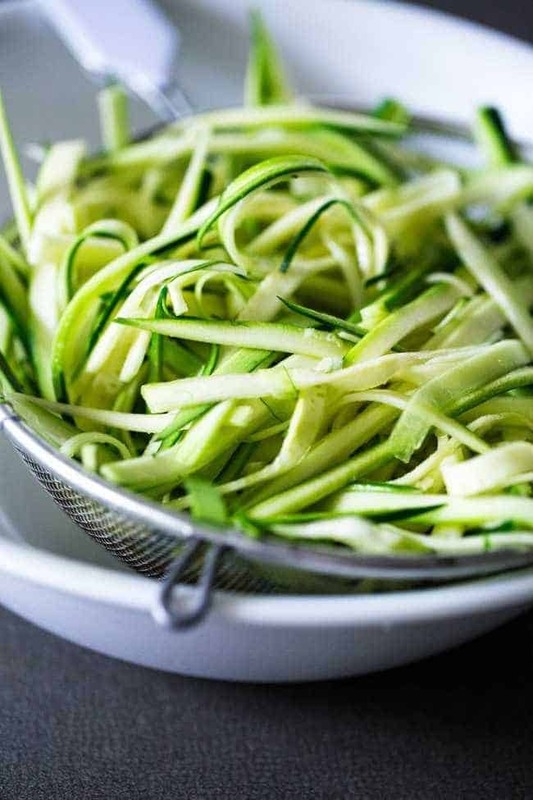 Toss the zucchini noodles with a sprinkle of salt, and let them sit in a strainer over a bowl for 20-30 minutes. 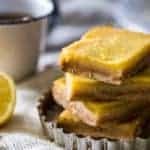 Stir them around a few times while they strain. 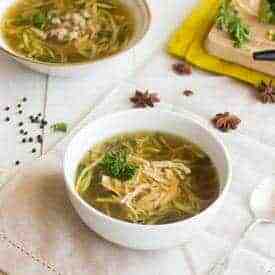 Combine the water and vegetable broth in alarge pot and bring to a boil. Once boiling, add in the cauliflower and cover. Boil until the cauliflower are tender, about 6-7 minutes. 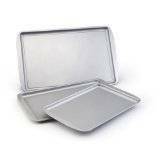 Remove from heat and cover to keep warm. Do not drain! In a large bowl, mix together the ground chicken, cheese, 1/4 cup green onion, 1 tsp salt, 1 1/2 tsp garlic, oatmeal, Ranch powder, pepper and egg white. Stir until evenly mixed. Roll the meat into balls (I like using a small 1 1/2 Tbsp cookie scoop) and place onto the prepared baking sheet. Place into the oven and bake for 10-15 minutes, depending on how big your meatballs are. Heat the 1 Tbsp of Olive olive in a medium pan and cook the garlic and onion until lightly golden brown. 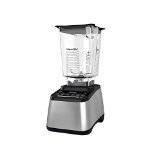 Add the cooked garlic and onion into a large food processoror blender. 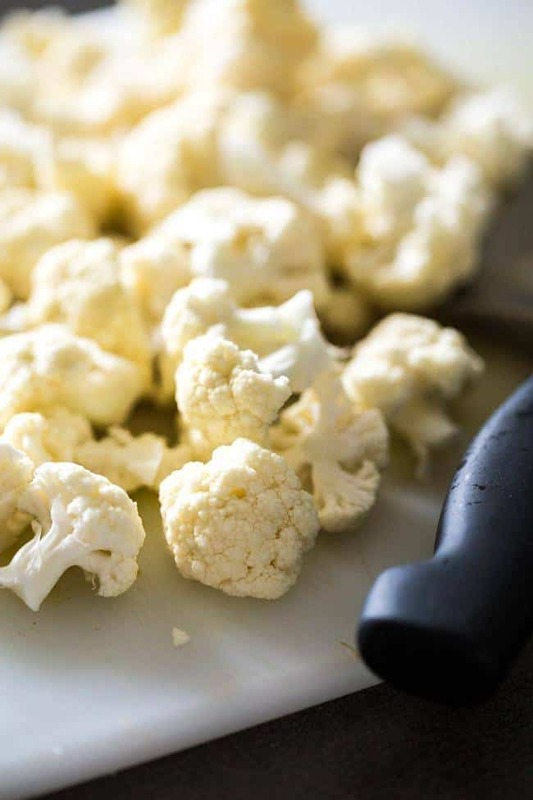 Using a slotted spoon transfer the cauliflower into the blender and add in the salt, pinch of pepper and the milk. Blend and then add in 3-4 more Tablespoons of the cooking liquid until the sauce reaches desired consistency. Squeeze out the excess water from the zucchini noodles and divide between plates. Top with cauliflower sauce, meatballs and drizzle with buffalo sauce and extra green onions, if desired. 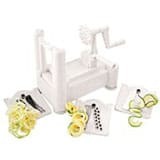 *You can also use a spiralizer to make the noodles! I LOVE THIS ONE! 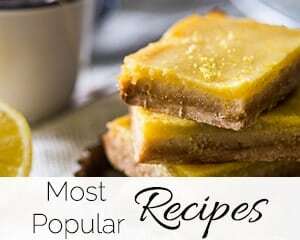 You make the most creative recipes, Taylor! I’m in awe of this one. I love that you made chicken meatballs flavored with ranch, my fave! And that cauliflower alfredo sauce looks perfect. 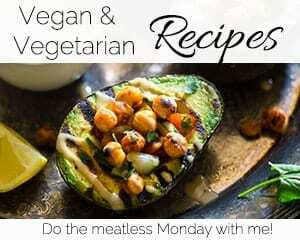 I love the different ways that you prepare this veggie. Pinned! I am totally in LOVE with all things ranch!! Thank you Gayle, I hope you have the best weekend! Delicious comfort food right there! This look so good. Oh my gracious! Must try! And can you believe I’ve never made zucchini noodles. There’s definitely something wrong with me! WHAT?! 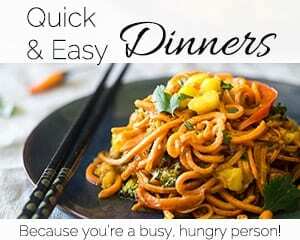 You need to try zoodles! They are the bomb!! Thanks Melanie, happy weekend! my mouth is watering for these even at 7:30am! 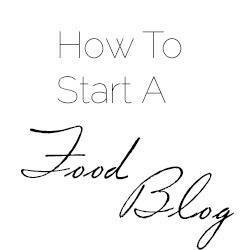 going on my meal plan menu soon!! Woo hoo! Thanks you so much! 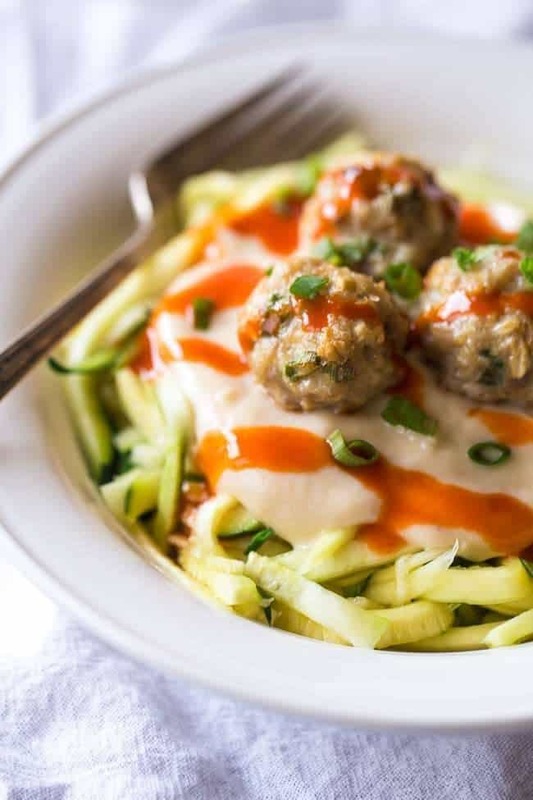 I pretty much love everything about this recipe…that sauce…those meatballs…those zoodles! What a fantastic idea to use cauliflower for the sauce! Okay, this is awesome! 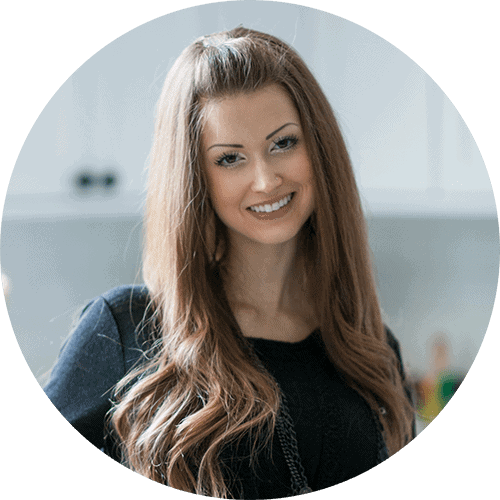 I love that we both did buffalo chcken meatballs this week and I am dying to try that SAUCE! 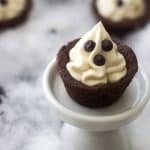 Pinning all this deliciousness! Tis the season! I hope you love the sauce…it’s good on EVERYTHING. Thanks Tori! P.s your cake today is GORG! Thank you chica! So glad that you approve!! 😀 Happy Friday! Absolutely gorgeous photos T! Who knew meatballs could be so pretty? <3 Pinned! Ohmygah, that bowl is so many things! I love all the components, m’dear! I have yet to make creamy cauliflower sauce and can only imagine how tasty it isatop zucchini noodles. Those meatballs? Baller! Have a great weekend! GAH. You need creamy cauliflower saucey goodness in your face, on your face…just make it! Thanks chica, happy weekend to you! My hubby would love this! Thanks for sharing. Pinned! Mine sure did! Thanks for the Pin Julie! Lady – your photos so rock – those ranchy chicken balls are just begging for me to reach into the screen and grab one! 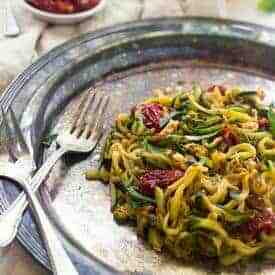 Love the veggies masquerading as sauce and noodles in this! Thank you my love! I hope you have the bestest weekend that ever walked the planet! Ok so I’ve done cauliflower rice, puree, mash, bake, and roast, but never a sauce. I totally need to try this out Taylor, it looks amazing! You NEED to try it in a sauce girl, it’s BOMB! Thank you! yes yes yes 1,000,000,000 times yes! I’m OBSESSED with cauliflower lately….and with Buffalo always. Cauliflower is SO good and versatile right!! Thanks lady! Hey, if you cover it with buffalo sauce, he might totally oblige 😉 Thanks CakePants! I’m hopping on a plane right now! 😉 Thanks Carla! Thank you Taylor for the nice recipe and have a good weekend! You’re so welcome! And you as well Liz! You’re right, creamy cauliflower sauce has been haunting me from all over the interwebs, and now I think you just put the nail in the coffin with this. Buffalo chicken ranch meatball?? How can you crave something you’ve never tried? I don’t know, but I so am right now. Haha! Thank you so much Joy! Totally try the cauli sauce, even if it’s not this one…because it’s awesome! Thank you SO much for giving the cauliflower the loving it deserves- I have a couple of recipes to share featuring and was scared the florets would get a bashing! The entire meal combination sounds amazing- Pin/Stumble/Salivate. Definitely no bashing, it;s the greatest veggie ever! Thanks so much big guy! Loving the zoodles! And I suppose now I’ll have to give the cauliflower sauce a try…it is EVERYWHERE. You make it look good though. Way better than a Q-tip. Haha! Glad you think it’s better than Q-tips 😉 thanks friend! So I think you can keep rolling with this cauliflower thing. I’m kind of drooling all over my keyboard. This is an option I’m definitely interested in! Good, because I have a new cauliflower obsession 😉 Ha! Thanks chica! 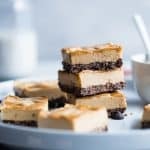 This looks so good and I know my family would love this recipe! 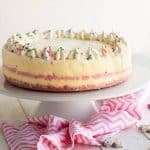 oh wow, this looks divine!!! thanks for sharing! 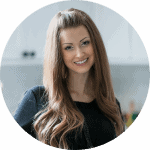 Of course – thanks Celyn! This meal sounds so freaking good!! 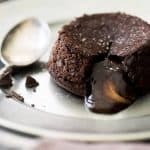 I made this for dinner and they were a huge hit! 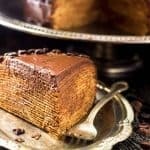 Everyone was talking about how moist and delicious they were! 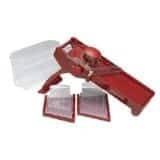 They are so easy too! Thanks! Yay! This makes me so happy to hear! Glad everyone enjoyed them! Thanks for sharing! 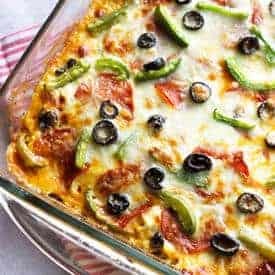 My husband loved this dish, and he isn’t big into veggies, so I hope yours does too!